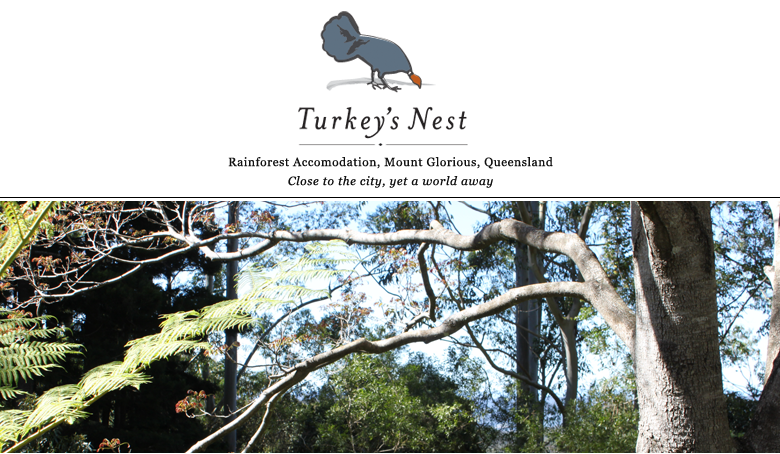 It's now ten years since we opened Turkey's Nest at Mount Glorious (we had a small B&B in Brisbane before that). 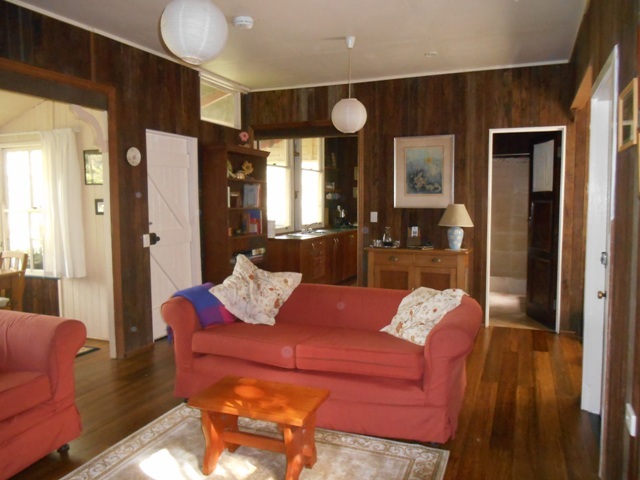 When we bought the property the original cottage, White Gum - an old forestry workers' cottage moved from Beerburrum - was a little 'rough around the edges'. 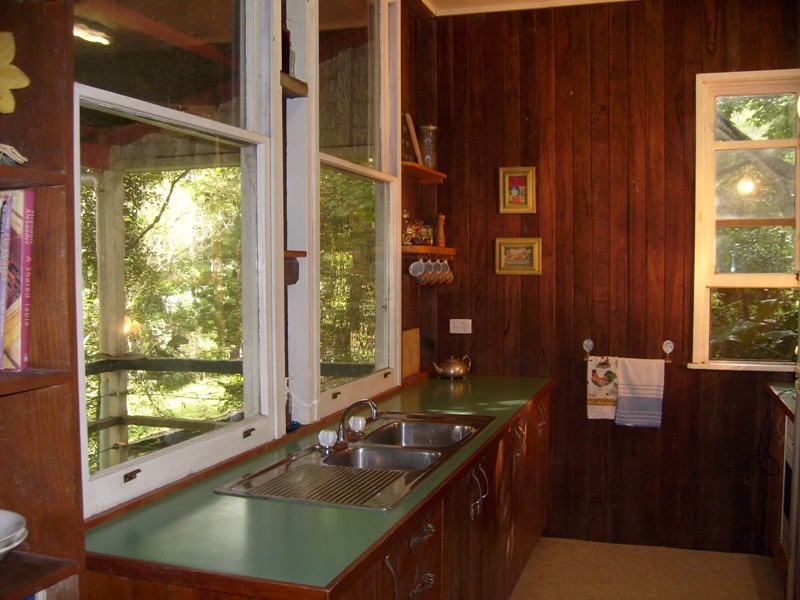 The best view was from the laundry, the kitchen faced a blank wall, and the bedroom had no view! We renovated it in 2003, moving rooms and adding a new bathroom and kitchen. The original kitchen - pretty grim! Our guests love the cottage and its old world feel, but last year we decided it was now due for another makeover (aren't we all?!!) 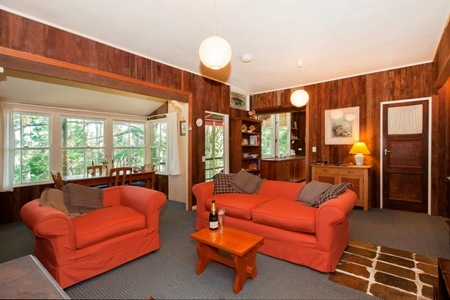 that would update the cottage without losing its charm. The first job was to replace the flooring. 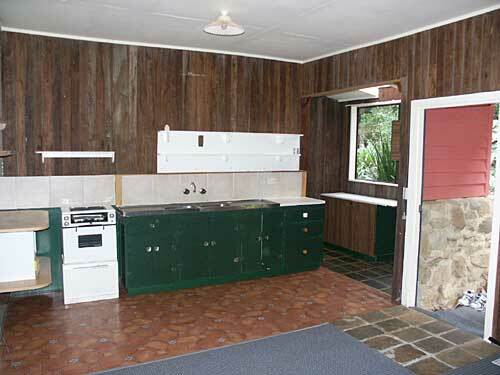 There was carpet in the living and dining areas, and lino in the kitchen, with a bit of slate tile at the front door. As it's a small area, a uniform flooring throughout this space was preferable. 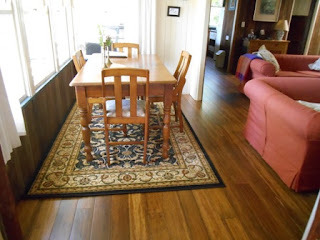 Unfortunately the existing timber floor under the carpet was an uneven, patched-together, un-salvageable mess, so we decided to cover the lot with a floating bamboo floor. Various finishes are available, including an 'aged' finish which suited the style of the cottage. Bamboo is a renewable resource- it is a grass and grows very quickly. Whereas oak takes 120 years to grow to maturity, bamboo can be harvested in three, regenerates without need for replanting, and requires minimal fertilization or pesticides. The flooring can also easily be laid DIY. Russell and a friend laid the floor in a day and a half. 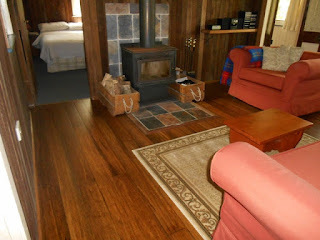 The foam underlay overcame the unevenness of the existing timber floor. The slowest part was getting the initial line, after which the boards clicked together quickly. It took another day to make and add hardwood skirtings. A couple of rugs, sourced cheaply from Grays Online, completed the picture. 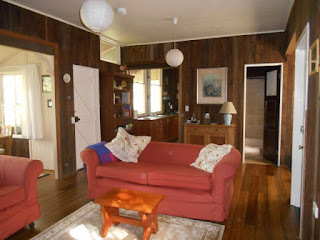 It gives the whole cottage a finished, unified look and has maintained the old world feel. The only hassle was a bit of swelling and lifting when the wet weather hit, which required some trimming. In retrospect, we should have left a little more space around the edges, under the skirting boards, to start with, and no further adjustments would have been required.